O Remanso Dos Patos Hotel is a small, traditionally designed 8-bedroomed rural hotel which has lots of character and charm. 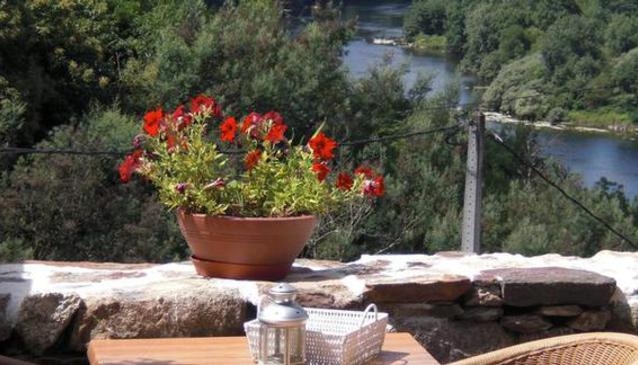 It is located near Ourense in the mountains close to the stunning canyon cut by the River Miño as well as the River Sil canyon and the gateway to Ribeira Sacra so is a great base to explore the area. The hotel has all the modern comforts and is immaculately run by Natacha and her husband Anthony. Facilities include non smoking rooms, air conditioning, daily newspaper, desk and hair dryer, laundry service/dry cleaning, restaurant, room service and safety deposit boxes. The hotel offers massages and terraced garden with small pool to provide extra pleasure and relaxation for all guests.The hotel is in the countryside so is the perfect spot to unwindand there are great views of the mountains and the canyon below. Special mention is warranted for their restaurant with the owner and chef Anthony serving up high quality dishes using the finest local products with his innovative french style touch so you are in for a real treat. It is also a hotel which is children, pet,gay and allergy friendly! It is certainly one of our favourite hotels in the area both for its comfort and cleanliness and quality of the food.